The Chicken Coups Are Taking Over the World! Home/Caring for Chickens/The Chicken Coups Are Taking Over the World! While this title may sound funny, it's not at all far-fetched. In fact, there are many people across the world who are trying to create, design, and build chicken coups so they can keep chickens in their backyards. And... No! I don't just mean the United States. People from Europe, Australia, Asia, and even Africa are seeking help and ideas for building better housing for their chickens. The funny thing is... a 'chicken coup' could refer to the radical overthrow of any world government by chickens. Your little flock of chickens trying to operate a coordinated coup of your country's legislature. Far fetched? Maybe! But for our sakes, let's refer to them as the growing movement of everyday people (that's you and me) who are deciding to raise our own chickens. And while 'green' is a big part of the political environment today, chicken owners may not face such a cheerful reception from their neighbors and local governments. The above quote is an example of how local legislators are trying to control your ability to raise your own chickens. 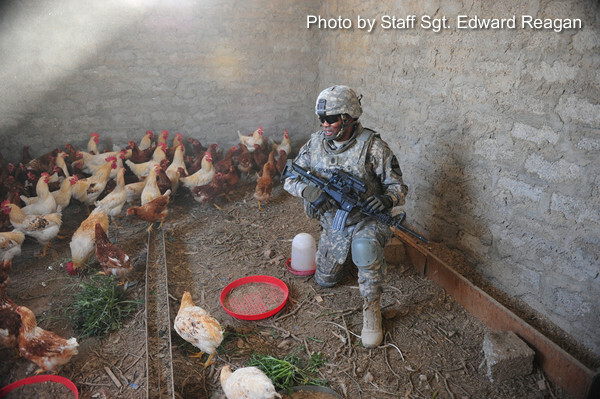 And here's a short glimpse into the steps and strategies your government might take to control your chickens. This clip, from Louis Porter's article, 'Small farmers take dim view of avian flu plan', paints a startling glimpse into you could be affected by the government. The federal plan would require livestock owners to tag their livestock, allowing the government to track them back to their origins if problems arise. Larger animals would probably need special ear tags. Smaller livestock like poultry would likely be tracked in flocks under the federal system, although some worry that small operations would have to put leg bands on individual birds. Opponents are skeptical because the tracking plan, developed during the scare over mad cow disease, was hatched by a collaboration of federal officials, agriculture organizations and farm technology companies that make identification systems." And with just two short extracts, you can easily peak into the potential problems you might face if you become a part of the growing chicken movement. The beneficial impact of raising chickens for third world and agrarian societies is even more dramatic. You will continue to see more and more news, and updates, as many people in your area and around the world join the chicken coups. This article is just an encouragement, and a warning for you, if you are thinking about being a part of the chicken coups. Here’s Where My Chicken Coop Journey Began, Does It Sound Like Yours? Chicken Poo is Good for the Soil, and other Backyard Gardens! Ever Heard of Raising Your Chickens on the Roof?